Audiobook - The Adventures of Sherlock Holmes by Sir Arthur Conan Doyle performed by Patrick Horgan (Unabridged) Format mp3 files by chapter for download ~ 560MB zip file. The idea which vaulted Holmes to stardom very quickly was that of making him the hero of a continuing series of short stories which would appear in Strand Magazine, illustrated with those famous Sydney Paget drawings. It is interesting to note that the publisher thought he was engaging the services of Walter Paget but wrote to his brother instead. Thus the famous figure of Holmes was that of Walter Paget, drawn by his brother, and the well-known deerstalker was one of Walter's. The series was an instant success. 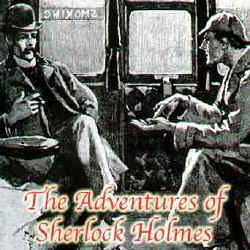 No writer of that period, including H.G.Wells and Kipling, could sell magazines like Conan Doyle and Sherlock Holmes. The first story appeared in Strand Magazine in July 1891, and he wrote the next six stories at a fevered pace, about one a week, for £35 (pounds) each. The tumultuous reception enabled Doyle to increase his price for another six stories to £50 each.